Villa Nanda is in unbeatable location. You'll have the shops, bars and restaurants as well as Waikiki Beach virtually on your doorstep. What's more the world famous Corralejo Sand Dunes and spectacular beach of Grandes Playas are only 10 minutes' drive away. The villa is contemporary and stylishly decorated, plus has its own private pool - ideal for a relaxing holiday. Air conditioning/heating in the bedrooms, pool heating and WiFi are included. 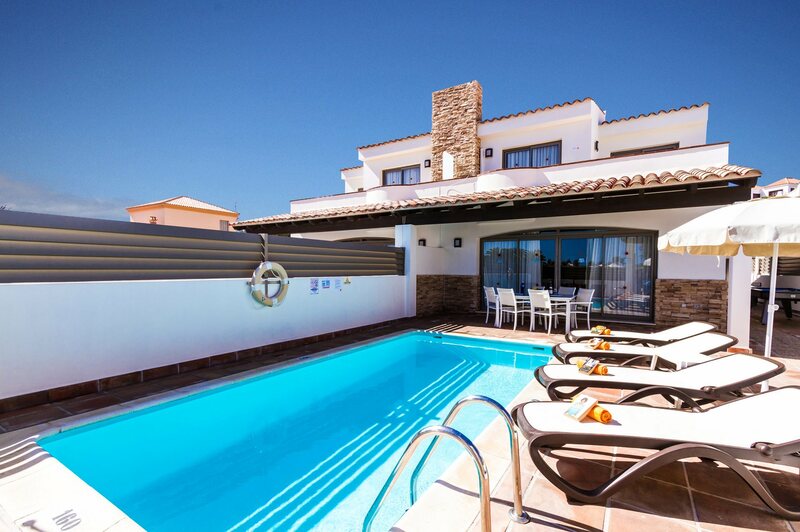 A contemporary villa with a private pool in the heart of Corralejo - you couldn't ask for more. The outside area is great for soaking up the Canarian sun. There is a private swimming pool, a shaded terrace with a table and chairs and brick BBQ - all vital ingredients for an enjoyable holiday. At the side of the villa there are games tables for everyone to enjoy. From the road, the gates open onto the pool area and the front door is to the side of the villa. The lounge/dining room is bright and spacious and has access to the pool area. There is comfortable seating, a flat screen TV and a dining table and chairs. The well-equipped contemporary kitchen is adjacent and has access to the utility room. There is a twin bedroom with an en suite shower room on the ground floor. The remaining bedrooms - a double and a twin - are located on the first floor. Both bedrooms share the facilities of the separate bathroom and have access to the shared terrace. The double bedroom also has a private terrace too. Villa Nanda is in residential area with restaurants and supermarkets just a stone's throw away. The beach of Waikiki is 5 minutes on foot and Galera Beach is 5 minutes further. What's more the spectacular Corralejo Sand Dunes and breathtaking beach of Grandes Playa are both 10 minutes' drive away. You can even take a ferry from the harbour to Playa Blanca and visit Europe's first underwater museum. Villa Nanda is semi-detached with Villa Jenny and our Villas Ola, Sirena, Pino and Juliana are nearby. There are shops a few minutes' walk from the villa. If you're after some retail therapy, then 2 shopping centres - Las Palmeras and El Campanario - await you. Here you can find high street fashion, designer shops and cafes. There is the local market on Tuesdays and Fridays - great for bargains! Best to get there early as it gets very popular. The bars and restaurants are virtually on your doorstep where you can enjoy lunch at one of the tapas bars which have typical local food from the island and cater for everyone's taste. Or by night enjoy the live music venues and eateries near Waikiki Beach with views out to the ocean. At Corralejo Harbour you will find good quality local restaurants. Waikiki Beach is the closest to Villa Nanda, 5 minutes' walk away. There is the sandy beach of Galera a little bit further away and of course the stunning beach of Grandes Playas, 10 minutes' drive away. You will be spoilt for choice as Fuerteventura claims to have the best beaches in the Canary Islands! Acua Waterpark in Corralejo offers a variety of water slides and tubes or you may choose to venture in to the wave pool or the lazy river! You can even try your hand at crazy golf which is also located at the Acua Waterpark. El Cotillo is a little fishing village and is dedicated to the virgin of good travel (Virgin de Buen Viaje) and these words can be seen painted on the cliffs in the old harbour. This is truly the surfing and windsurfing Mecca of the island. These monster waves have even been known to sink some of the small fishing boats that are moored there. Many experienced surfers head to the beaches of El Cotillo and those between El Cotillo and Corralejo because of these conditions. The Mirador de Lobos Golf Resort in Corralejo is the closest one to Villa Nanda. Alternatively, there are other golf courses in Caleta de Fuste located on the East Coast just after the airport. You can try the go-karting track in the capital Puerto del Rosario. Smaller karts are also available for children. Or, try water sports such as windsurfing, snorkelling, kayaking and catamaran sailing. Villa Nanda is not available to book for season as it is sold out. Take a look here at the Fuerteventura villas that are currently on sale. Fabulous villa, great location. Everything you needed. Our second time at this villa and we love it because of its central location. Lovely modern villa 2 min walk to centre and 5 min walk to beach, yet quiet and private. Would highly recommend! A lovely bright, clean villa in an excellent location. We had a member of our party with walking disabilities and this villa could not have been better. All the facilities in the villa were spot on with every appliance we needed. Thank you Villa Plus! Our only problem was the welcome pack which had a few items missing but our rep sorted and exceeded our expectations. Fantastic Vila in a great location. Will definitely book with you again as it was so stress free. very clean,plenty of kitchen items etc and exactly what we expect when we pick it,no complaints at all. Villa Nanda was really well presented, wi fi availability inside and outside villa was a bonus, very good maid and pool service,the location was perfect for our needs - close proximity to a good beach, surf schools, the old town/port, promenade, shopping, restaurants etc. Corralejo was a much nicer place than we had realised having made a brief trip to spend a day there on a previous holiday - would certainly choose to return to Corralejo on our next visit to Fuerteventura.